Many of these children are resilient; others face problems that persist into adulthood, but resources are available for intervention and support. According to the National Institute for Mental Health, 9.8 million Americans aged 18 or older, or 4.2% of the adult population, are living with a serious mental illness such as schizophrenia, bipolar disorder, or major depressive disorder. Other mental illnesses that may affect parenting and child welfare include obsessive-compulsive, paranoid, psychotic, panic, and posttraumatic stress disorders. Because two-thirds of females and one-half of men afflicted with serious mental illnesses are likely to be parents, "There's a significant number of individuals with some level of emotional distress who are raising children," says Joanne Nicholson, PhD, a professor of psychiatry at Dartmouth Psychiatric Research Center in The Geisel School of Medicine at Dartmouth University. These parents may bequeath to their children a legacy of physical, emotional, or social impairment or dysfunction that may manifest in feelings of guilt or low self-esteem, instability, and difficulties with employment, socialization, interpersonal relationships, and parenting their own children. Many children of parents with serious mental illnesses are resilient and will not experience these challenges. But for those who do, the problems may persist into adulthood and, without acknowledgement or attention, may have the power to negatively affect many aspects of their lives. This lingering impact on some of the adult children of people with serious mental illnesses, experts say, has been widely overlooked. A significant portion of individuals with such illnesses and the problems experienced by their offspring often go unrecognized, in part because only a small percentage of the population with these illnesses receive services, and of those who do, a significant percentage are probably not questioned about their parenting status, Nicholson says. Thus, both the children and the parents tend to be underserved. These issues may be compounded and exacerbated by other factors within the family. "It's important to understand the context of families where one or both parents has a mental illness," says Barbara J. Friesen, PhD, a research professor at the Regional Research Institute for Human Services at the School of Social Work at Portland State University. "These families are often characterized by poverty, may consist of single-parent households, and/or be challenged by conflict and disrupted parental relationships. These contextual factors may be related directly or indirectly to parents' symptoms and/or behavior." All children are not equally affected. "Some are born more vulnerable than others and some have vulnerabilities that are conveyed by bad economic climate, poor housing climate, many social and environmental conditions, and unsafe neighborhoods," Nicholson says. "There are a lot of factors that contribute to how well people do in general, and having a parent with a mental illness is just another domain of vulnerability," she says. According to Friesen, the research literature identifies many challenges for the adult children of people with serious mental illnesses. "The older literature focused almost exclusively on problems and was not strengths-based. Older studies looked at rates of mental health and behavior problems and substance abuse, as well as issues such as 'parentification'—role reversal, where children become caregivers of their ill parents. Data sources were usually secondary, not gathered from the adult children themselves, but rather based on agency and clinical records or on studies using service providers as sources. These data, therefore, were biased in the sense that they did not include adult children who had not sought treatment. Major problems identified were higher rates of depression and other mental health problems, higher rates of substance abuse, social adjustment issues, and increased suicide risk in children whose parents committed suicide." In addition to these issues, resentment commonly arises among the adult children of people with serious mental illnesses, triggered, Sherman says, by the parents' resistance or failure to get help, their noncompliance with treatment, and the burden of caregiving. "As the offspring have their own families, they often continue to dedicate a lot of time to caregiving, which can be logistical, such as taking the parent to doctor appointments or attending to financial, emotional, and legal issues," says Michelle Sherman, PhD, an associate professor at the University of Minnesota Medical School and coauthor of I'm Not Alone: A Teen's Guide to Living with a Parent Who Has a Mental Illness. Also contributing to the pressures of caregiving is the fact that individuals with serious mental illnesses experience a higher than average rate of other medical conditions. Furthermore, many offspring are troubled by concerns for their own children. "They may be afraid that their children will develop serious mental illnesses as well," says Sherman, who adds that the research is clear that offspring are at an elevated risk. Whether these problems persist throughout life, Nicholson says, depends on a number of variables. "The impact of a parent's illness on a child or young adult varies depending on the nature and severity of the adult's illness; the extent to which the family has stability, resources, and support; and the extent to which the child or adult has internal resources and supports themselves are all factors that go into the equation of how well a person will do," she explains. Interventions provided in childhood may prevent some, but not all, of the difficulties experienced by the now-adult children of people with serious mental illnesses, Sherman says. "There are a number of promising interventions and a few that have a solid research base," Friesen says. "Interventions range from services such as care coordination to family-based interventions and clinical interventions with adolescents, and families also benefit from practical support, such as income assistance, housekeeping, transportation, and recreation. There are some nice cognitive behavioral prevention programs with some follow-up data showing positive outcomes for youth and decreased rates of depression among kids," she adds, pointing, for example, to the work of William Beardslee, MD, at Harvard University. Also contributing to lack of services for both parents and children is the remaining stigma surrounding mental health issues. But even when stigma is overcome and helpful interventions exist, many offspring never are able to take advantage of services when they are children or later in life. "These are kids whose issues often do fall through the cracks," Nicholson says. "The first problem is that their parents' problems go unrecognized, so their needs also go unrecognized." Chief among the obstacles to obtaining care for the adult offspring, Friesen says, may be a "general lack of information and understanding that many people with serious mental illness are parents." And the flip side of that, Sherman says, is that offspring of parents with serious mental illness, regardless of age, often feel invisible. "They're often ignored and no one asks about the impact of their parent's mental illness on them." Friesen says, "Lack of funding, proven programs, public and policy-maker understanding, and appropriate professional training, and poor coordination between adult and child mental health services," also contribute. Medicaid funding, she continues, "tends to pay only for services for individuals, not for families, although that is slowly changing." Sherman adds, the "continued division of funding streams and care for adults and kids" is also a factor. "The way funding streams are organized around identified parents, the medical model of treatment requires that there be an identified parent with a medically necessary condition to justify payment and reimbursement," Nicholson says. While some of the offspring do have diagnosable mental conditions themselves, many do not. "So unless you're a person whose condition has been identified by a credentialed provider and deemed medically necessary by the rubrics and treatment algorithms that are applied, then there are lots of cracks," Nicholson says. In addition to lack of programs, lack of access to treatment, and financial barriers is lack of awareness by clinicians of the availability and helpfulness of those services that do exist, Sherman says. And even when children do get treatment, she says, "this doesn't ensure the parent will get or stay in treatment, so the burden can continue." "Parents often are afflicted by many types of illnesses, and we have huge mega-marathons for breast cancer, for example, and lots of awareness of other kinds of conditions," Nicholson says, "but less support for mental health." On the positive side, Friesen says, there have been some strides forward. She points to "better research information about effective interventions, some decreased stigma about depression, more studies that directly ask children about their lives, and a move toward broader, more holistic interventions in addition to narrowly focused clinical studies," though she adds that the latter are important, too. The major limitations to the research, Friesen says, are the use of "second-hand information, only looking at clinical populations, and a general narrow vision of the problems and solutions." Obstacles, she adds, include a lack of specific funding and interested researchers. Program evaluation or effectiveness studies, she says, can't be done when there are no programs. "Reforms are needed to improve coordination between adult and child mental health services. Researchers in other areas in adult mental health—for example, supported employment, case coordination, medication management—could include parenting issues as part of studies," Friesen says. "There's also much to learn from studies of effectiveness of early intervention, either done by professional mental health workers, allied professionals, or in settings such as Head Start and day care." "The good news is that there are lots of opportunities to provide resources and support, so if you don't catch a child, you catch them when they're older," at the individual, family, or communities level, Nicholson says. It's a ripe field for social workers, Friesen says, "especially since they take a strengths-based biopsychosocial approach and are more likely than others to focus on the whole person and the whole family." 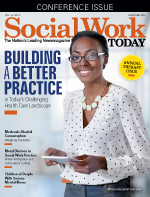 Experts point to the important role social workers have in advocating for and participating in much-needed policy research. "It's a great fit because social workers are trained to think systemically. They embrace and understand the complexity of community and family life and appreciate the context in which people are living their lives, so their training is consistent with the right kind of approach for teasing apart complex sets of relationships, Nicholson says. Friesen advises interested social workers to become familiar with the recent literature, "especially that coming out of countries where there's more research and more services addressing these issues, such as Australia, Norway, Sweden, and The Netherlands," and to attend conferences addressing the subject. "Australia and the United Kingdom are far ahead of the United States of America," Sherman says, "and have many great programs and free resources." Nicholson agrees that other countries and cultures are ahead of the United States in addressing this issue. "In Norway, Finland, and Sweden," for example, she says, "if a parent is diagnosed with a serious physical or mental illness, providers are obligated to inform their children and provide support." Sherman and Friesen both direct social workers to the website of Children of Parents with Mental Illness in Australia (www.copmi.net.au), which highlights relevant activities, studies, and services. "Take a sabbatical to Australia," Friesen says, "and get involved." Sherman also suggests that social workers become familiar with the Daughters & Sons Initiative (www.dandsinitiative.org/index.php), which has good information about workshops, online podcasts, and more. Memoirs by offspring, she adds, such as Daughters of Madness: Growing Up and Older with a Mentally Ill Mother, by Susan L. Nathiel, PhD, can also help social workers and others understand the experience of living with a parent with mental illness. Others include Growing Up with a Schizophrenic Mother, by Margaret J. Brown, and The Memory Palace: A Memoir, by Mira Bartok. "This is a massively understudied area and is most deserving of funding, resources, and research. I think we can collaborate with and learn from colleagues in the United Kingdom who are doing this work," Sherman says. "We need to improve our understanding of changing experiences and the needs of adult offspring over time, available resources, and what could be helpful to support them. Sadly, just as their experiences and needs are typically neglected in childhood, they can become even more neglected in adulthood. The potential to empower offspring may benefit not only them and their ill parents but also potentially support their own children/families," Sherman says.